is honored on Panel 34W, Line 31 of the Vietnam Veterans Memorial. THANKS FOR YOUR SERVICE AS AN INFANTRY OPERATIONS & INTELLIGENCE SPECIALIST. IT HAS BEEN FAR TOO LONG FOR ALL OF YOU TO HAVE BEEN GONE. WE APPRECIATE ALL YOU HAVE DONE, AND YOUR SACRIFICE. WATCH OVER THE U.S.A., IT STILL NEEDS YOUR COURAGE. GOD BLESS YOU. MAY THE ANGELS BE AT YOUR SIDE. REST IN PEACE. YOU ARE ALL IN OUR PRAYERS. IT WAS JUST EASTER - GOD'S BLESSINGS ON YOU. 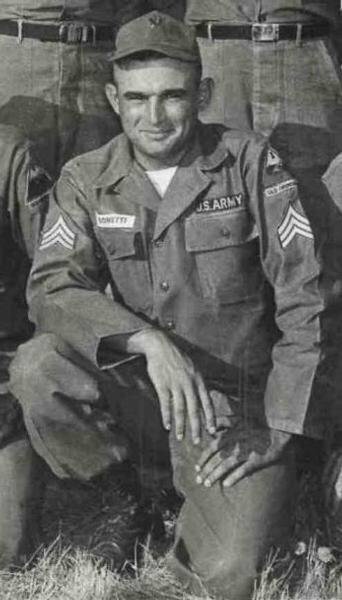 Staff Sergeant Freddie Allen Bonetti, Served with the Headquarters and Headquarters Company, 5th Battalion, 46th Infantry Regiment, 198th Infantry Brigade, Americal Division.